Picea glauca var. albertiana 'Pixie Dust' is an extremely dwarf, dense conical selection of Alberta spruce with typical short, gray-green needles. This plant's defining characteristic is a pleasant yellow second flush of needles suggesting that it has been dusted by pixies. The overall effect is similar to another cultivar of this species, 'Rainbow's End,' expect that 'Pixie Dust' grows at less than half the rate. After 10 years in the garden, a mature specimen will be only 16 inches (40 cm) tall and 6 inches (15 cm) wide suggesting an annual rate of growth of slightly more than 1 inch (2.5 cm) per year. 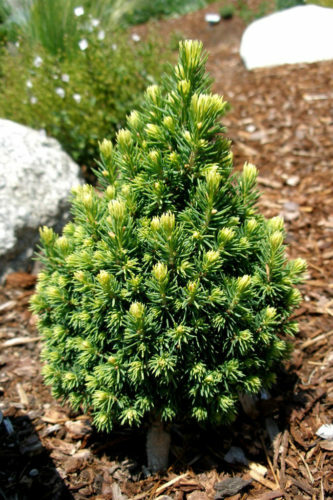 This cultivar originated at the Iseli nursery, Boring, Oregon in 1994 and was one of two plants selected in 2006, the inaugural year of the ACS Collectors Conifer of the Year Program. Picea glauca var. albertiana 'Pixie Dust' at Albers Vista Garden, Bremerton, Washington.